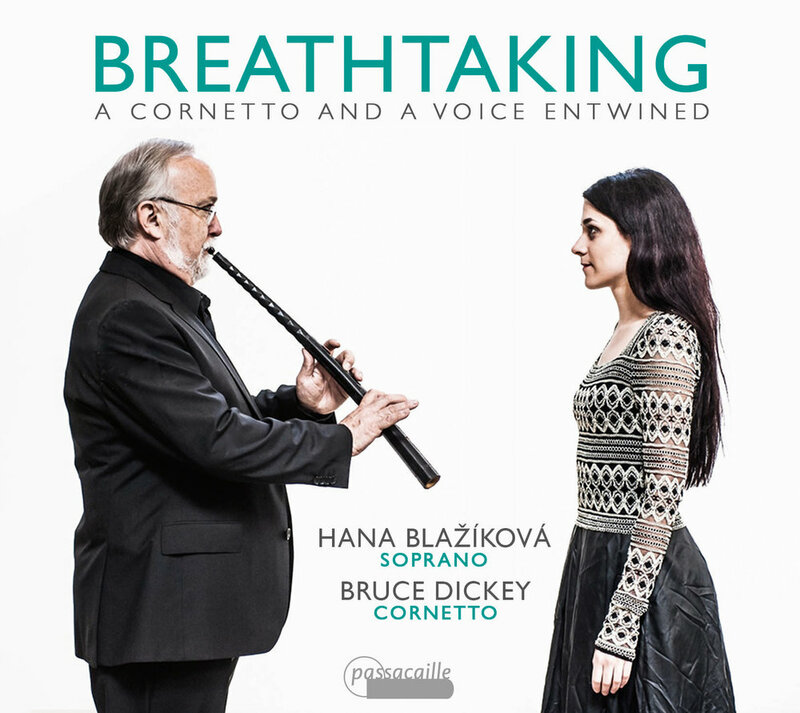 Dickey’s artistry is in full flight on his newest recording, Breathtaking… The agility and spirit of Blažíková’s singing are beautifully complemented by Dickey’s cornetto as it responds to her lines, or anticipates them, or simply sings with them. …they absolutely fit like a glove and achieved ‘breathtaking’ balance and intimacy. Blazikova’s execution seems to flow directly from the underlying narrative of the text, and time and time again I thought just how ‘conversational’ the line of her singing was. The soprano was exquisite, her first entrance in each new piece somehow more refreshing and sensational than all previous ones. Her voice has a unique beauty, a pure, colorful tone, with a mezzo-like dark energy. Her unadorned, but elegant and shapely phrasing connected notes and words in a wonderful musical whole. Dickey’s playing was equally eloquent… His cornetto had an attractive, uncanny quality, as if the sound and articulation of the instrument were coming straight out of his throat. Mal umschmeicheln sich Stimme und Instrument und verschmelzen zu einem Klang, mal behaupten sie sich neben-, nach- und gegeneinander. Doch immer zeichnen sich der Zinkspieler und die Sopranistin durch immense Virtuosität, hohe Musikalität, perfekte Intonation und beseelte Musizierfreude aus. Das Album "Breathtaking" ist wirklich atemberaubend schön. In the sixteenth and seventeenth centuries, the cornetto was fabled for its astonishing ability to imitate the human voice. This imitation encompassed not only its clear and bright sound, but also its agility, expressive range, dynamic flexibility, and articulation, which could make it sound almost as though the player were speaking through his instrument. Our program, which puts this imitation center stage, is called “breathtaking” both because the voice and the cornetto literally make music with the breath, and because the imitation, we hope, can figuratively take the listener’s breath away. The young Czech soprano, Hana Blažíková, described as “one of the most exciting voices in the baroque scene today” here joins Bruce in celebrating this instrumental-vocal pairing. Our program begins at the turn of the 17th century, when the cornetto was at the absolute summit of its development. Both singers and cornettists were expected to be consummate improvisers, and while singers took the lead in defining the style of ornamentation (even called gorgie for the use of the throat in articulating the quick notes), cornettists were famed for their embellishments as well. This virtuoso ornamentation soon found its way into solo music in the new style with basso continuo as well. In these pieces cornettists would have carried on a musical conversation with singers, constantly imitating and echoing their musical phrases and their embellishments so that the voice and the instrument seem “entwined”. The third part of our program explores the final phase of this story. At the very end of the 17th century, especially in Rome and Naples, the cornetto enjoyed a late flowering, playing obbligato parts of often astounding difficulty in operas and oratorios by such composers as Alessandro Scarlatti and Giovanni Battista Bassani. It is literally the last breath of the cornetto. In between these groups of pieces which frame the 17th century, we have asked renowned Greek composer Calliope Tsoupaki to write a new work exploring the commonality of the cornetto and the voice. This new composition sets the text Mélena imí (Nigra sum), already heard on the program in a setting by Tarquinio Merula, and is described by the composer as a serene antiphonal moment for voice and cornetto. For concerts in 2020, see my page on the new project, On the Breath of Angels, premiering in March 2020.